The use case that led to this extension: our members log in on the website and have to be able to renew their membership, buy products and training, buy job adverts and register for events. When it comes to paying they need to be able to select an invoice address for this specific occassion. That could be their own private address, but also the address of their employer or the address of the co-operative group they are part of, or the address of their own company. The are a few settings for the Invoice Address API. You can access them with Administer>Invoice Address API Settings. This setting shows all the relationship types that will be checked for billing addresses. 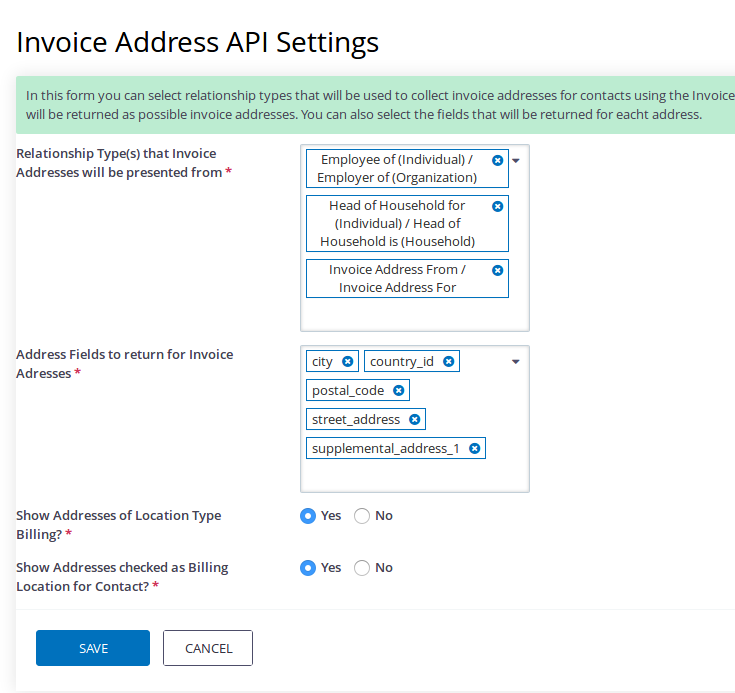 So for example if the Employer/Employee relationship type is in the list, the API will look for the billing addresses of the other contact in the relationship and present them as possible invoice addresses. In this setting you can select what address fields from CiviCRM will be returned with the Invoice Address API. Show Addresses of Location Type Billing? This setting controls if the addresses with the location type Billing (the name of the location type has to be Billing) are collected with the InvoiceAddress API. Show Addresses checked as Billing Location for Contact?